Short Gut(s) and Gumption | Real life takes guts. Tales of a real family and the adventures of short bowel syndrome. Short Gut(s) and Gumption – Real life takes guts. Tales of a real family and the adventures of short bowel syndrome. Real life takes guts. Tales of a real family and the adventures of short bowel syndrome. September is NICU awareness month. We spent 3.5 months there, I don’t forget it. I knew that I needed to draw awareness to this important nod at the medical experts, hospitals, infants and families who spend time in the NICU fighting…it’s not an easy place to spend your days. Things change on a dime and the only thing that you can do is LOVE, ADVOCATE, PRAY, LOVE, DISINFECT, PRAY LOVE, REPEAT. My pregnancy probably started a lot like most… maybe even yours. Reading ‘What to expect’ daily and watching the weekly videos as Camden turned from a radish and moved to a squash. I was ALL BELLY- they said a bump up front and a bump in the trunk :p until 34 weeks and I blew up like a balloon- swollen EVERYWHERE (especially my feet) and high blood pressure and liver pain brought me into the hospital with SEVERE HELLP syndrome. A condition that nearly killed me and left me in the ICU for nearly a week with an impeding blood transfusion. Many children born to mother’s with HELLP end up in the NICU. HELLP happens- I didn’t know that I could be the .02%. Camden was seemingly healthy and in the newborn nursery until he began vomiting blood and things changed quickly and thus ended up managing SBS in the NICU for 3.5 months prior to transferring our care to Boston for complex GI medical management. I loved our nurses in the NICU they were a saving grace. Many have asked- many haven’t but have wondered- did you know? Did I know that I would have a magical little boy yes. Did I know that he would be 1/500 who experience malrotation and experiences a medical emergency… no. Would that have changed anything? Nope. Advocacy-Why does speaking up matter? Why do we share Camden’s story? It hasn’t always been an easy task- at times writing took every last ounce of energy that I had left at night- but 1) it matters for support, being a special needs parent can be very isolating 2) It matters for education, because someone somewhere might happen across one of our posts and find answers to questions they desperately need 3) It expands awareness for short bowel syndrome and rare disease to a community and readership beyond our own. Did you know that short bowel syndrome is SO rare that we have to educate many healthcare providers on Camden’s critical care needs? We had to educate our insurance provider, our community, our therapists, and the list goes on… We are not alone, others in the SBS community around the country and the word are doing the same- this is the life of rare disease, ‘this’ doesn’t come with a manual- this isn’t written in the laws or the codes or … many places beyond a few medical journals, specialized research labs (here’s looking at you Boston Children’s) and hospitals. Why is a patient/caregiver’s voice important? This is because the collective of many individual voices gives purpose to a cause… there are not enough voices for many rare diseases to make an impact in our communities, in medicine, in politics- so together we make for a larger impression-so that we are heard and so that we aren’t forgotten. Take all underlying political motives aside (as these are always assumed)- this is unfortunate… unfortunate because the political process is who controls healthcare in this country and this is the only place to speak up for Camden’s needs… no one else can make (or break) the changes that Camden needs to support his rare and hugely complex needs. So when I speak- it’s not democratic, it’s not republican, it’s not libertarian it’s nothing but a true voice of Camden’s needs to WHOEVER can make it happen and who will listen, to whomever has compassion. If lifetime limits were imposed on medical policies… Camden would have likely reached his lifetime limit before leaving the NICU at 3.5 months. Camden had a pre-existing condition on day-2 of life. Right now he is covered through our family policy- we are covered only by a private health plan. If a pre-existing condition becomes a factor for denied health insurance… a lost/changed job will leave Camden without the coverage that allows him to be treated at Boston Children’s Hospital (the care that saved/continues to save his life)… and… one day Camden will be an adult and he’ll take on his own policy… what happens then… the condition still exists. The specialized care of many chronic/rare disorders are only researched and medical intervention applied with expertise at a small number of hospitals- i.e. for short bowel syndrome the most expertise is at Boston Children’s Hospital… AND many Medicaid plans don’t allow for transfers out of State and or require lengthy burdensome processes for families to possibly facilitate a transfer… so if you have Medicaid.. you might not get the care… if States manage the care.. then what? We don’t have Medicaid- but I speak from the experience of others. Finally, I’ve seen extensive wait lists and denials for those who could truly use the support of Medicaid for their families. Families working to make ends meet, families in crazy amounts of debt because of care they’ve incurred for their children- STILL being denied Medicaid benefits or being forced to wait. Who said that there was time? So, these are facts. This is Camden’s story. This is our world… and I share…. for all of these reasons…. I share. I’m not politically charged, I’m Camden’s mom. I’m a friend. I’m an advocate and I see a lot… much of which many people don’t…. honestly… you wouldn’t see these things unless you were in our world- that’s ok- but please listen- because if it were you- you’d want someone to listen too. We are all immune until it happens to us- the only common denominator is compassion- and as I mentioned before this issue is unfortunately forced into politics because of the way our (USA) and most of the world’s systems work. It is what it is. Not everyone has an agenda. Well, actually… in full transparency, I do … it’s Camden. So we did share our story with our State, because it’s our right, because it’s our responsibility to speak on behalf of the stories that aren’t seen and because we care about Camden… not only today… but tomorrow too. The picture attached is from when Camden’s story was shared on Capital Hill in DC. We’ve done our part, in honor of Camden. In honor of RARE. In honor of medical complexities. I’m back after a brief hiatus. Hello everyone 👋 Camden had his central line removed last month and we are re-adjusting to life without it. I needed some time to digest this change before sharing what that means for all of us- SO What DOES that mean? It’s also meant that we’ve been more comfortable traveling away from our home and having family watch Camden for a night or two out (the first since he was born 2.5 years ago). Weddings and road trips oh-my! We’ve been refocusing how we use the time we’ve found in our days since we no longer have TPN prep, weekly ordering of supplies, multiple sterile procedures, cap changes, dressing changes, etc. etc. etc. Honestly- Eddie and I are re-exploring our autonomy as inviduals and as a couple- and finding outlets that are personally fulfilling. Our parenting is still very very hands on- but for the first time we are able to re-group and expand our focus to include ourselves. We’ve both felt a bit funny doing this – but after a few weeks of some personal focus- we realized how desperately we both needed it. 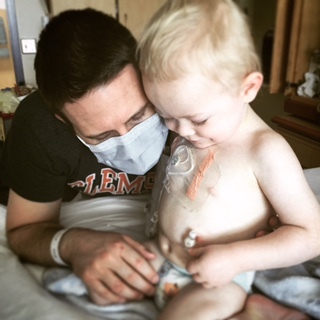 This week we had our first hurdle- post line… Camden had a small flash of blood in his stool that alerted us to get a stool sample- and we learned that he has C.Diff- so we are dealing with the symptoms and have started a long and intense round of antibiotics. His spirits have been high despite this and his symptoms have been minimal- thank goodness! Note: Camden also had a surgical curcumscison during this surgery (poor guy) but this surgery was complication free and things have healed well. This post comes on the first day of HPN (Home Parenteral Nutrition) week- a week of awareness for living life on this live-saving therapy. We are HUGELY thankful for this therapy that saved Camden’s life- and I’ll be posting more about this later this week. Life can be SO FULL on HPN- it’s different NOT less. My second Oley Conference is behind me- and again I was blown away by the support and companionship that proves strong through the community of those on nutrition support. I love the daily interactions, inspiration and love that surrounds the breakouts and meetings…old friends, new friends and life-changing connections. This year, the opening ceremony was especially moving. Maybe this is because over the past year (and in each passing day) I realize the amount of strength that transcends our population- my awe only grows stronger. Award winners with smiles and tears telling their stories- beautiful. This year a very pleasant surprise was a speech by Dr. Stanley Dudrick, the Father of parenteral nutrition. I was blown away by the pushback that he received and his selflessness in the development of his therapy, an unfortunate theme that occurs frequently in the pioneering of cutting edge medicine. He didn’t hold back his struggles and I was awe-struck with that- especially presenting to a room of people with overwhelming challenges of our own. His story is one of inspiration- he’s saved many many lives as the result of his science and medicine- including Camden’s- one of my favorite moments to-date was being able to thank him for that (of course he wouldn’t take credit)- a wonderful man- a hero. (Google him- there is a plethora of information available- and he’s more than deserving of his own future post). The rest of the week was orchestrated SO well- break-out meetings, presentations, the sharing of evidence-based information and COMPANIONSHIP. Oley brings together the power of the community, consumers, caregivers, vendors, etc. all empower each other over the course of days, and it’s an incredible experience to be a part of. I was very proud to see Boston Children’s in attendance this year, Camden’s rockstar team. I can’t tell you what it’s like to share our story with a family who is new to the community, to offer them hope and resources or how it feels to speak to an adult with short bowel syndrome to gain insight into the physical and emotional impact that the disease has on Camden- the impact that he’s too young to share OR to learn of the new products and resources available to families over the past year- because people have committed themselves to progress for this population. It rocks. Gus Gear is a welcome addition to our SBS journey. A central line (especially on a toddler) needs to be secured so that it doesn’t pull and cause complications to the integrity of the (life) line. People ask me all of the time if Camden fusses with his g-tube and line… and really- he’s pretty good to leave his ‘accessories’ alone. However, even if a child isn’t one to explore and test the waters with the line- precautions are important- because external factors can wreak havoc when a line isn’t secured. For the past two-years we have secured Camden’s lines with a variety of dressings and tapes. We’ve tried them all. They work ‘ok’ but they only have roughly a day’s lifespan and they are hard on Camden’s sensitive skin…a necessary evil. There is nothing that breaks my heart more than when I have to remove tape from Camden’s skin- he winces and cries even when I try my very very best to keep him comfortable. I’ve been looking for an alternative for a very long time- another SBS mom suggested that I try Gus Gear… Boom! Really? This amazing wrap has been under my radar for 2 years? I’m so glad that I found it- better late than never. BONUS: It was developed by a fellow SBS mom! …now we need to rid the tape on Camden’s g-tube and come up with a more ‘stylish solution!’ #seeyoulatertape! Check it out at http://www.gusgear.net. We’ve had a lot of ‘firsts’ lately… my gratitude for this is two-fold- the actual events AND this is evidence that Camden is healthy enough for new horizons. This weekend was the ‘grand opening’ at the lake, my parents new home. It’s been a dream of theirs for a very long time and I’m so proud of this accomplishment for them. They’ve been HEAVILY (ever) present in Camden’s health journey and it’s so fulfilling to see them turn this page. Our weekend has been filled with friends and family. This has been Camden and my first trip outside of TN/BOSTON since we took the leap of Faith to move a nearly a year ago. Having family and friends around to spoil Camden with QT … (and a wide- range baby monitor during nap times) meant that Eddie and I could spend some time decompressing. Reflecting. Fishing. Laughing. Singing. Dancing (as humiliating as my moves are 🤦🏼‍♀️)… but still have Camden steps away. SO WONDERFUL. We did it! We managed to travel to and from Canada without incident! I held my breath the entire time… but it wasn’t necessary, Camden did so well on his maiden travels to his mother’s motherland. We celebrated a wonderful memorial for my grandfather and visited with friends and family- it was good for the soul. I’m sorry to those who I didn’t see who reached out and wanted to connect- it was such a busy family weekend, seeing everyone was an impossible task- we’ll be back!